It may still be early in the year, but NASA already has a reason to celebrate 2012: two gravity probes are successfully in orbit around the moon, and their science mission is ready to get under way. 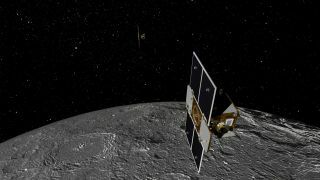 NASA's twin Grail spacecraft (short for Gravity Recovery And Interior Laboratory) arrived at the moon over the New Year's weekend, seamlessly slipping into lunar orbit after more than three months of journeying through space. The probes are designed to map the moon's gravity in unprecedented detail. By shedding light on the lunar gravity field, researchers hope to better understand how the moon formed and evolved. "So far these spacecraft have operated nearly flawlessly," Maria Zuber, Grail principal investigator at the Massachusetts Institute of Technology in Cambridge, Mass., said in a press conference Tuesday (Jan. 17). "I've said that I know now what it's like for people who raise twins, but they're very well behaved twins." Zuber spoke during a NASA event to unveil the new names of the twin Grail spacecraft, which were originally dubbed Grail A and Grail B. NASA held a nationwide student contest to find new names, ultimately picking the monikers "Ebb" and "Flow." The names were selected from an essay contest that more than 11,000 students from 900 schools participated in. The winning names were suggested by a class of 28 fourth grade students at Emily Dickinson Elementary School in Bozeman, Mont. Currently, both spacecraft are operating independently, but after a series of engine maneuvers, the two probes will be placed in a tandem orbit just 34 miles (55 kilometers) above the moon's surface. Then, the Grail probes will be ready to begin collecting data in early March, Zuber said. "In that way, we will map the moon, determine the gravity field, and gain our understanding of the inside of the moon," Zuber said. Zuber also described the excitement and joy experienced by the entire Grail team as they rang in the New Year celebrating the significant orbital milestones. "On New Year's Eve and New Year's Day, the sparkling cider was popping at the control rooms of the Jet Propulsion Lab in Pasadena, [Calif.] as well as in our control room at the spacecraft contractor Lockheed Martin in Denver," Zuber said. So far, the twin spacecraft have performed excellently, she added. And while the year has already started out on a high note, the team is now focused on the crucial science that will be performed at the moon. "Spaceflight is a risky thing, and whenever you have two of something, it doubles the opportunity for things to go wrong," Zuber said. "But so far so good, and both of the spacecraft are operating very well and behaving. We're really trying to keep our eye on the ball here."